When we left it was around 1:30 and the entire town was closed. It was almost eerie walking around, middle of the week, middle of the afternoon and the only souls to be found were the men at a another cafe smoking cigars drinking espressos. I personally can't imagine taking three hours off in the middle of the day for lunch and a nap, but when you see how genuinely peaceful and happy the Italians are, it makes you wonder. 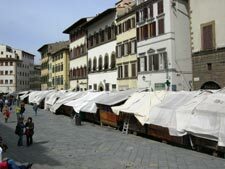 We spent a few days going into Florence and I found the best shopping at the Straw Market off the Piazza de Republica. I can't stress enough that Florence must be experienced on foot. As the birthplace of the Renaissance, Florence is a city where everywhere you look is beautiful architecture and art. Plus the scooters everywhere make driving hellish. TIP: Take the train from Dicamano, which is about 3 miles from the Villa into Florence. Trains run every half hour or so and takes you right into downtown. One restaurant we did go to in Florence which you must go to and I can believe I don't remember the name, but it is right next to Trattoria Z (A?-Z? at the Mercato di San Lorenzo (Mercato Centrale). Our waiter was from Hungary and made the best recommendations. Outstanding dinner. This piazza is off the beaten path so most of the diners where natives. There is an underground parking lot here so if you did decide to drive into Florence, this would be a great place to park and explore the surrounding areas. TIP: At the Galleria dell'Accademia is the statue of David and on Tuesday nights after 7pm, admission is FREE. People line up at 6, but the Gallery is open until 10, so if you go around 8, you'll have no wait. The market off the Duomo was great for chotchke shopping and gifts to bring home. One regret is that I didn't buy anything for the ceramica vendor in that market. 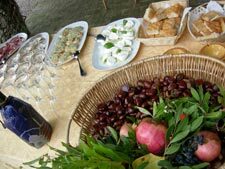 I drove all over Tuscany looking for a deal as I was hoping to buy a complete dinner set, and oddly enough, the shop in the marketplace was the best deal.